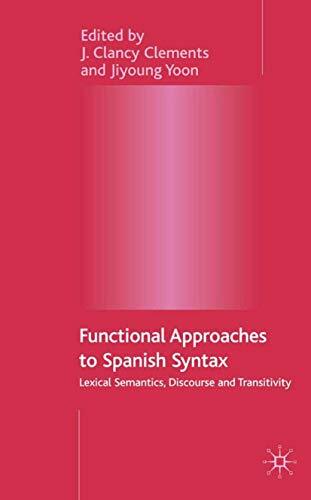 The first usage-based approach of its kind, this volume contains twelve studies on key issues in Spanish syntax: word order, null arguments, grammatical-relation marking, inalienable possession, ser and estar, adjective placement, small clauses and causatives. The studies are approached within a broad functionalist perspective. The studies strengthen the view that components of grammar intricately interact and that a usage-based approach to analyzing them offers new and insightful perspectives on some stubborn problems. J. CLANCY CLEMENTS is Associate Professor of Linguistics and Spanish and Portuguese at Indiana University, Bloomington, USA. He received his M.A. in Spanish from the Universität Tübingen, Germany, and his Ph.D. in Romance Linguistics from the University of Washington, Seattle. His main areas of interest are contact linguistics and functional syntax, with a focus on varieties of Iberian Romance languages. His publications include The Genesis of a Language: The Formation and Development of Korlai Portuguese (1996) and The Linguistic Legacy of Spanish and Portuguese: Colonial Expansion and Language Change, four co-edited volumes, as well as over 30 articles on language contact phenomena and functional linguistics. JIYOUNG YOON is Assistant Professor of Spanish and Spanish Linguistics and a Co-ordinator of the First and Second-Year Spanish program at the University of North Texas (Denton). She received her M.A. at the Universidad de Guadalajara in Mexico and her Ph.D. at Indiana University. She specializes in functional syntax and semantics as well as foreign language instruction and pedagogy. She has published articles on semantics and in Spanish from both functional and Construction Grammar approaches. She is currently working on a cross-linguistic study of subject and object coding.